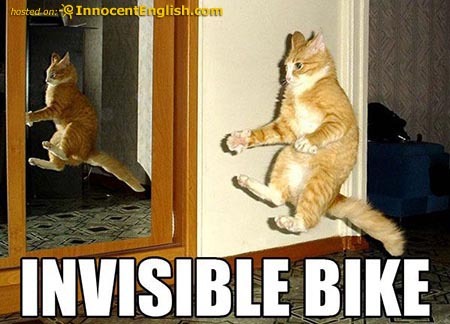 Did you know animals love bikes? If not, you need to read Duck on a Bike by David Shannon which chronicles a ride a bunch of farm animals take on. Included is a trike and a road bike and a mountain bike and a tandem and just about every other imaginable cycle except for recumbents. Read it to your children, because they like bikes, too. While you’re at it, you might check out some of our library’s other favourites, Maestro’s elusive Bike Trip, the ubuitous Curious George Rides a Bike, and our favourite the ultra-cute Miffy’s Bicycle which is perfect for all those Oregonian children with the line “it may rain and I may get wet, but I will not care.” Other bike book suggestions can be found here and here.If you’re not riding with your kids, this is the least you can do for them to get them started thinking about it. Meanwhile, you should check out a copy of Bicycling with Children by Bike Friday tandem owner Trudy Bell. She really covers all the details. Personally, I think the tandem is a brilliant idea for kids since it has a low risk factor since you’re in control, yet gives the child a sense of independence and it allows you to talk to one another. Our tandems add an easily approachable low-stepover and kids love the wheels that are more proportionally sized to them. Furthermore, our bikes are very adjustable and could easily handle growing with your child for a good long time. Don’t forget that our triples convert to doubles. My wife and I have been using our triple as a double for a while now, but are committed to making sure Sierra gets on the bike with us next summer. Then I’m going to build her one of our new Little models which were intended for Little People rather than juvenille people, but it works better for younger children than our standard bikes would normally.If you have any further questions about riding with your kids, please send them over. It’s something I’ve really enjoyed with my daughter and, with the right information, you can, too! Hopefully by now you have seen the pictures of our experience at the Northwest Tandem Rally. If not, read the write up, too. Anyways, I was talking to a customer about it and next year’s rally. I went to the website to find out some more info for them and it was oddly vague. This is odd because we were given flyers with registration info and everything. Since this is going to be in the gorgeous wine country that Yakima, Washington is, this is not something to be missed. So I scanned the form for all to see. Enjoy and hope to see you there! I had enough of Blogdrive. Sure, it’s free and flexible but there are many little glitches. Discovering that the RSS feed was sort of jerry-rigged kind of set me over the edge. I’ve long wanted a blog like Michael’s or Brad’s that allowed for catgories. This way there’s really only need to have one blog. I find far too much intersection between the two I have now (one for the family and one for the bike stuff) and I struggle to know where to put anything, especially now that we have this tandem. Realizing that Michael was using WordPress I thought I’d give it a shot.